Disney on Ice Let's Celebrate is a party on ice with all of your favorite Disney friends as they celebrate all of your favorite holidays. It is described as a magical medley of holidays, celebrations and festivals from around the globe, including a winter wonderland, a Halloween haunt, a Royal ball and more. 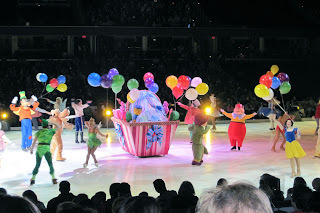 Last night, the family headed to Cleveland to watch the Disney On Ice Let's Celebrate Show. The show was very good, and very current, even the characters from Princess and the Frog was part of the show. 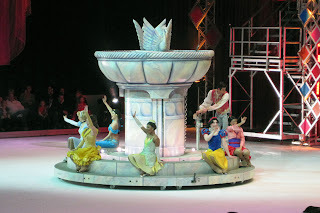 The opening of the show gradually brought out many of the familiar Disney characters - from Mickey Mouse to the Mad Hatter and, of course, the Princesses. My daughter was totally in awe of the Princesses. As each Princess came out, she wanted to know who it was and where was Cinderella. The first half of the show included an Un-Birthday Party, a Halloween Haunt, a Royal Ball and more. The Halloween Haunt was an interesting way to include a number of your favorite villains - including Cruella De Vil, Ursula, and the Evil Queen from Snow White, amongst others. The Royal Ball featured the Princesses and their Princes, dancing to their theme song as they tried to help Minnie answer the question how will I know if I have met my Prince. The second half of the show seemed to be much shorter than the first half and many of the celebrations didn't include many of the Disney Characters - which made those feel a little like filler to make the show longer. It did introduce some new favorites that had not been part of the first half - Lilo and Stitch, Woody, Buzz and other toys from Toy Story. I think the cutest one to see on ice was Hamm from Toy Story. I couldn't imagine being the skater in that costume in a crouched position for that long though. Both my son and daughter enjoyed the show. When asked, my son told me first that the part of the show where the brooms came alive was his favorite and then, that seeing the skating was his favorite. My daughter told me that seeing Alice from Alice in Wonderland was her favorite (I would have guessed princesses, but you know she's 3). My daughter asked if we could go again on the ride home. Seeing the skaters spinning, jumping and lifting was great. It makes me look forward to the Winter Olympics. We went ice skating with the kids a few weeks ago for the first time and this was the first ice skating performance the kids had seen. I think it will be fun to watch some of the skating with them during the Olympics, now that they are more familiar. Disney on Ice Let's Celebrate will be in Cleveland for 17 shows at the Quicken Loans Arena from January 8th to January 18th. Friday, January 8th at 7:00 p.m.
Saturday, January 9th at 11:00 a.m.
Saturday, January 9th at 3:00 p.m.
Sunday, January 10th at 5:00 p.m.
Tuesday, January 12th at 7:00 p.m.
Wednesday, January 13th at 7:00 p.m.
Thursday, January 14th at 7:00 p.m.
Friday, January 15th at 7:00 p.m.
Saturday, January 16th at 11:00 a.m.
Saturday, January 16th at 3:00 p.m.
Saturday, January 16th at 7:00 p.m.
Sunday, January 17th at 1:00 p.m.
Sunday, January 17th at 5:00 p.m.
Monday, January 18th at 1:00 p.m.
Monday, January 18th at 5:00 p.m.
Not from Cleveland? This coupon code will also work for shows in other cities. You can find out more about the tour here. I received no compensation for this post. My family and I received tickets that we might be able to enjoy the show and share about our experience. Tickets were courtesy of FELD Entertainment and Mom Central.